This post was written by Jonathan Landsman, who took my Mushrooms course in Fall 07. He is a busy graduate student of Horticulture, here on the Cornell Plantations Public Garden Leadership fellowship. Good grief, who would have thought that a blog on fungi would be so full of disgusting things? Seems like every fungus is out to make its own kind of mess: molds turn your strawberries to mush, stinkhorns turn your mulch into putrescence, and inky caps (genus Coprinus) turn themselves into a black goo as you see here. I gotta say, I love mushrooms but I wouldn’t want to have to clean up after them. A time lapse study of Coprinopsis growing on a cube of poop by Kent Loeffler. To deliquesce is to liquefy. Most mushrooms don’t last more than a few days, but inky caps are usually here and gone in less than 24 hours! They have the fairly rare property of autodigestion, a habit of destroying themselves with their own enzymes once the mushroom has released its single round of spores. I’m a big fan of things that are even more slovenly than I am, so I’ve decided to make the why and how of deliquescence the topic of this blog post. Inky caps are not mushrooms you want to carry home in your shirt pocket! The mushrooms appear in wet conditions, but then the same moisture that brought life to the new tissue facilitates death: the inky caps digest themselves via hydrolytic enzymes, tiny biologic machines that use water to break down molecules. The slopfest takes just a few hours, from pileus to puddle. Then the once-mighty Coprinus comatus turns from a mushroom that can split asphalt into a thin liquid. 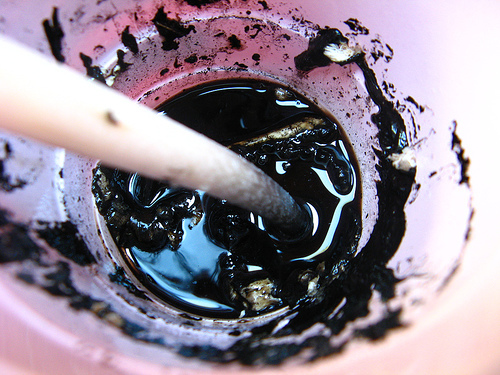 You can actually use this liquid as a semi-permanent ink . . . it’s only a matter of time before the practical joke industry discovers inky caps. But why would a living organism destroy part of itself? One reason is a bit like why the husk of a milkweed fruit becomes brittle and cracks once the feathery seeds within are mature. It’s a selective-death process that get useless tissue out of the way of the babies, letting them escape to as far from the parent as possible before they begin their new lives (it’s a little like college). As an inky cap deliquesces, the tightly packed gills separate and curl back, allowing some spores to float out into the air. If it’s worth it to you to get a little technical to learn even more about how mushrooms turn to muck, this section is for you. We already mentioned that hydrolytic enzymes are responsible for breaking an inky cap down into goo (“goo” is a technical term). Hydrolytic enzymes are not unusual; fungi secrete them to digest complex organic molecules into a nutrient slurry that their root-like mycelia can drink in. Infecting the winds that wander by. Lincoff, Gary H. National Audobon Society Field Guide to North American Mushrooms. Alfred A. Knopf, New York, 2006. Bonner, John Tyler; Hoffman, Allan A.; Morioka, Wilfred T. & Chiquoine, Duncan A. (1957). The Distribution of Polysaccharides and Basophilic Substances During the Development of the Mushroom Coprinus. The Biological Bulletin, 112 (1), 1-6. Hideyo Miyake, Tsuneo Takemaru and Tatsuo Ishikawa (1980). Sequential production of enzymes and basidiospore formation in fruiting bodies of Coprinus macorhizus. Archives of Microbiology, 126 (3), 201-205. Iten, W. & Matile, P. (1970). Role of chitinase and other lysosomal enzymes of Coprinus lagopus in the autolysis of fruiting bodies. Journal of General Microbiology, 61, 301-9. 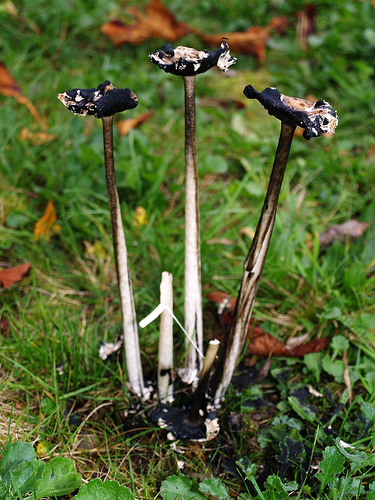 Images by Kent Loeffler (time lapse); Kathie Hodge, Blog Editor (ink in a plastic cup); hr.icio (disgusting stand of Coprinus); and pete_vn52 (melted mushroom triad). The latter two images are licensed under Creative Commons 2.0. Note that some of the mushrooms we’ve called Coprinus for a long time are no longer considered Coprinus species, and have been moved to genera of their own. One would think that that whole thing of having black spores and digesting yourself might have evolved only once, but no, there’s good evidence that all that evolved independently in several different groups of fungi. You can read a nice explication by Michael Kuo, here. And another thing. It baffled me that the chitinases these mushrooms make can annihilate the fruiting bodies but leave the spores viable. After all, spore cell walls contain chitin too. I put this question to a couple of pros without much luck. Then Jason Stajich asked Ursula Kues about it, and she pointed out that spores have more layers in their cell walls that other tissues, the first being a tough one that can survive the onslaught. I feel better now. I have a vague memory of having read several years ago that Coprinus Atramentarius are edible in the deliquescent stage. I no longer can find that reference. However, I tried them. I mashed them up with the ink and found that this made an excellent sauce for bland foods like potatoes and rice. Does anybody else eat them? 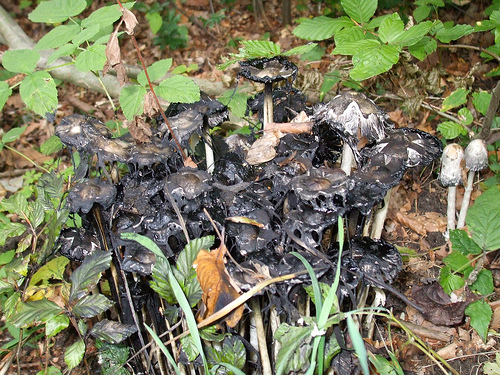 I MEAN im stuck in my friends herbs her mum found these mushrooms and the were like a stick but had blackish inky stuff drippping down it are they dangerous or are the harmless what are they called. I can’t tell from your description what you might have there. Maybe a Coprinus species like the mushrooms in this story. But maybe a dog stinkhorn in the genus Mutinus (Google the name to find some photos)? Dangerous? Probably not. But don’t eat any mushroom unless you’re sure you know what it is! I wonder if the chitinase kills & makes available the nutrients from insects so that the coprinus mycelium finds new sources of nitrogen, etc? i am ahmed shiedeed that i work on this strain in egypt i have fully molecular identifed it and keep in gene bank and have experience in its cultivation and natural compounds seperation.